Following is a list of the lessons and spiritual stages of the Naqshbandi Mujaddidi tariqah, as taught by the masters of the Mujaddidi tariqah. ,generally allows everyone to do the first Zikr, which is the Zikr of Latifa Qalb. But it is always recommended to get permission for it from a shaykh, which may be received even without making Ba’yah. The exalted Naqshbandi tariqah starts from ten Latāif (pl of Latīfā), which translates to subtlety. According to Imam Rabbani, a human is composed of ten subtleties, five of which belong to the Command-World (Ālam al-Amr) and five to the Creation-World (Ālam al-Khalq). The five from the Command-World are: Qalb, Rūh, Sirr, Khafī and Akhfā; and the five from the Creation-World are: Nafs, and the four elements (fire, air, water and earth). The Command-World is so named because it came into being instantaneously with the command “Kun”. The Creation-World was created in steps. The Circle of Possibility (Dāerā-i Imkān) combines these two worlds. The Arsh is at the center of the Circle of Possibility. The Command-World is the higher half (above the Arsh) and the Creation World is the lower half (below the Arsh). The Qalb (heart) is located two finger-widths below the left breast in the chest, somewhat oriented towards the side. When the shaykh teaches this lesson to a new seeker, he places his right index finger on this place and says “Allah Allah Allah”, while exerting his spiritual Tawajjuh on his heart (this method is only for men, women are taught verbally). The method of Zikr is like this: the disciple, after being taught this lesson by the master, starts proclaiming the Personal Name of God, Allah Allah Allah, in his heart by way of meditation. The tongue is not used in this method, rather it is recommended to touch it to the upper side of mouth to keep it silent. The disciple should clear the mind of all unnecessary thoughts and should keep busy in this Zikr at all times, even during the work. Initially, it might be hard to do this Zikr at all times due to external distractions. But slowly, by practice and by the Shaykh’s blessings, the heart becomes used to this Zikr so much that no further effort is required to do the Zikr. It becomes automatic like breath. The Nūr (light) of the heart is shining yellow, as described by the masters of this tariqah. However, viewing this color is not required, neither is the physical sound of heart’s Zikr required in this path. The real sign of completion of this lesson is that the heart is cleared from the lust and love of the worldly desires, and attraction to the real Beloved and keenness of following the Sunnah and Shariah is achieved. It becomes easier to control the appetite. Daily Murāqibāh is necessary in this sacred Path. The seeker should meditate for at least 15 minutes every day, possibly in early morning or whenever suitable. The muraqibah is done alone and in quite. The seeker should close the eyes, clear the mind of all thoughts and pray to Allah subhānuhū to take away the useless thoughts. Then he should imagine the noble face of the shaykh (Hazrat Khwājā Muhammad Tāhir Naqshbandī), or the one from whom Zikr was learned, at the place of the heart. It is recommended to cover oneself with a cloth (a shawl, etc). The seeker then concentrates on the place of Qalb (mentioned above), and imagines that the heart is proclaiming Allah Allah Allah Allah. This is called “Wuqūf-i Qalbī” and is the most important part of this noble Path. It means to keep one’s concentration towards the Qalb, and to keep the Qalb’s concentration to the Being whose name is “Allah”. The Latīfā of Rūh (soul subtlety) is located two finger-widths below the right breast in the chest, somewhat oriented towards the side. 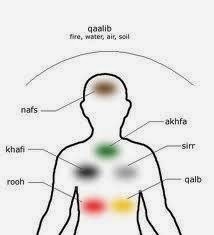 The seeker should do the Zikr of Allah Allah Allah at this location by way of meditation and thought. The Nūr of this Latifa is glittering red. The sign of completion of this lesson is that the seeker develops patience and control over his anger. The Latīfā of Sirr is located at a distance of two finger-widths from the left breast towards the center of the chest. Automatic Zikr is achieved in this Latifa by remembering the name of Allah at this location. The Nūr of this Latifa is milky white. The sign of completion is that greed is diminished and it is easier to spend in good causes for the sake of Allah. The Latīfā named Khafī is located at a distance of two finger-widths from the right breast towards the center of the chest. This also attains automatic Zikr with practice and Shaykh’s blessings. The Nūr of this Latifa is pure black. The sign of its completion is that bad qualities of jealousy and stinginess are diminished. This is located in the center of the chest. Its Nūr is green and the sign of its completion is that bad qualities such as arrogance and pride are diminished. Nafs, according to some shaykhs, is located two finger-widths below the navel. But according to the great Mujaddid Hazrat Imam Rabbani, may his soul be sanctified, it is located in the center of the forehead. The meditation of Zikr is done at this location and the arrogance and defiance of Nafs is removed. This Latīfā, which actually represents the four elements of the human body (fire, air, water and earth), is represented by the whole body. But usually the masters teach this lesson at the center of the top of head. This lesson is also called Sultān al-Azkār. The sign of its completion is that every single part of the body is lost in the Zikr of Allah. The flesh, the blood and the bones all remember their Creator with His Personal Name Allah. Nafī Asbāt is the recitation of Lā Ilāha Illa-Allāh (لا اله الّا الله) silently and without breath, as taught by the masters of this noble Path. Nafī means negation and refers to the first part (Lā Ilāha: there is no god), and Asbāt means affirmation and refers to the second part (Illallāh: except Allah). The seeker should hold his breath below the navel, and should take the word “Lā” from there to the forehead. From there, he should take the word “Ilāha” to the right shoulder, and from there he should hit the Qalb with the words “Illallāhu” so hard that its effect reaches the other Latāif in the chest. During one breath, this should be repeated three times. Then while releasing the breath, the seeker should recite with imagination “Muhammad-ur-Rasoolullāh”. This Zikr is done silently and without any body movements. It is necessary to focus on the meaning of these noble words, such that while saying Lā Ilāha, one should imagine that nothing exists, and while saying Illallāhu, one should direct the attention to Allah subhanuhū. In the beginning, this Zikr is done three times in one breath. After sufficient practice, this is increased to five, then seven, up to twenty one times in a single breath. The odd number for this lesson is called Wuqūf-i Adadī. This is highly recommended but is not a requirement. Also, the holding of the breath is not a strict requirement, and can be relaxed if it feels too difficult. After every few times, the seeker should remind himself that his ultimate goal is the pleasure of his lord and nothing else. He should recite this prayer: “O God! My goal is only You and Your pleasure. Grant me your love and your Ma’rifah”. Persian: “خداوندا مقصود من توئي و رضاي تو، محبت و معرفت خود مرا بده”. This is the recitation of “Lā Ilāha Illallāhu” in the same way as previous lesson, but with the tongue and without holding the breath. The daily minimum is 1100 and recommended number is 5000. Please note that the above lessons are properly learned from a perfected master of this exalted tarīqāh and should not be done without their permission. However, the first lesson of Qalb (heart) can be started immediately and can later be learned more properly from a Shaykh.